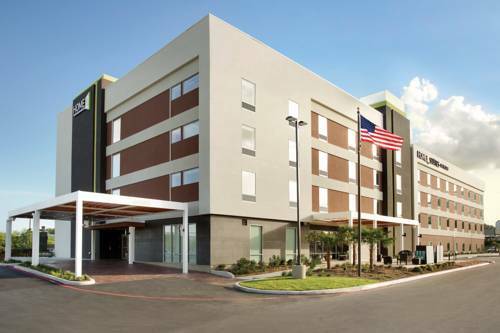 Boasting a fantastic location just minutes from San Antonio International Airport Home2 Suites by Hilton San Antonio Airport TX offers easy access to Interstate 410. Guests at this extended-stay San Antonio hotel can enjoy a complimentary shuttle service to the airport. Discover charming restaurants along the picturesque San Antonio River Walk ride rollercoasters at Six Flags Fiesta Texas or catch a basketball game at the AT-T Center. Start each morning with delicious hot and cold favorites at the complimentary Inspired Table breakfast buffet. Settle into a flexible studio or one-bedroom suite. movable furniture lots of storage and a separate living area means you can live the way you want to. Enjoy home comforts including free WiFi an iHome alarm clock and a fully-equipped kitchen with a dishwasher microwave and refrigerator. Order food to be delivered direct to your door for free or buy snacks medicines and sundries 24/7 at the Home2 MKT. Refresh in the outdoor saline swimming pool or multitask at Spin2Cycle our combined laundry/fitness facility where you can wash your clothes while you exercise. Plan an event for up to 15 people at this hotel in San Antonio TX in the 300 sq.ft. meeting room and print documents to the Oasis a relaxed lounge area where you can unwind with a magazine and charge your laptop. Meet friends old and new to cook dinner on the outdoor pavilion*s communal barbeque cooking grills. All reservations must be cancelled by 23:59 host time the night before arrival unless deposit is required. If this reservation has been made electronically please cancel it electronically to avoid confusion and a no show bill. Policy is subject to change.